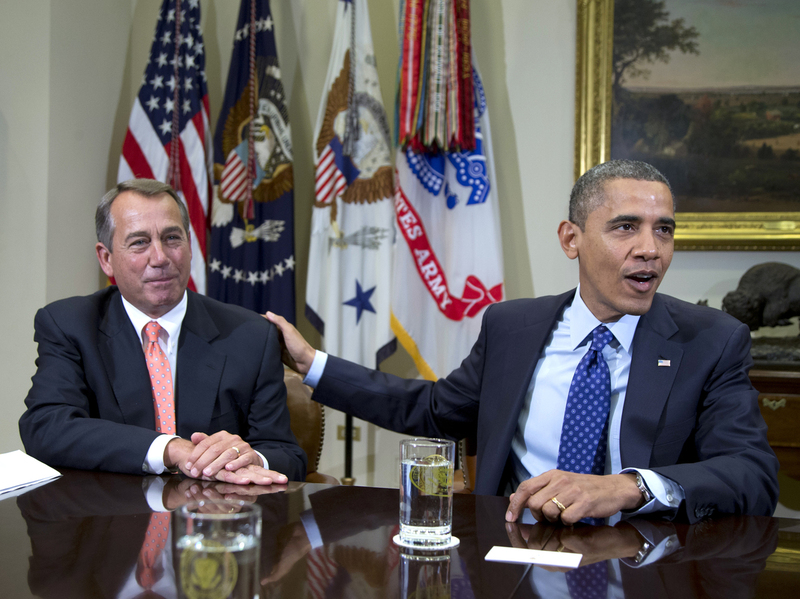 Obama, Boehner Meet At White House Over 'Fiscal Cliff' : The Two-Way The closed-door meeting between the two men may be the first positive signs in days that negotiations may be moving forward. Meanwhile, a top Republican said Senate Republicans could agree to higher taxes on the richest Americans if it meant getting a chance to overhaul entitlement programs. President Obama and House Speaker John Boehner at the White House on Nov. 16. Administration officials say the two men met Sunday to discuss the "fiscal cliff." President Obama and House Speaker John Boehner met at the White House on Sunday to discuss the impasse over the "fiscal cliff." NPR's Kirk Siegler reported on the closed-door meeting between the two men, the first positive signs in days that the negotiations may be moving forward. "In a statement to news agencies, a White House spokesman said only that the lines of communication remain open. Republicans and Democrats are trying to avert automatic across-the-board spending cuts and sweeping tax increases that are scheduled to go into effect at the first of the year – unless a budget deal is reached. There has been speculation that the chances of a long-term deal are slim before Congress leaves for the holidays. The main battleground has been over taxes. The President wants to restore Bush-era tax cuts for top income-earners. But Republicans have argued that would hurt the still fragile economy." Sunday's meeting came on the same day a top congressional Republican indicated flexibility on taxes, the main sticking point between the two sides. Sen. Bob Corker of Tennessee said on Fox News Sunday that he believed "something is going to happen." "There is a growing group of folks that are looking at this and realizing that we don't have a lot of cards as it relates to the tax issue before year end," he said. "I mean, we're — have one house, that's it. The presidency and the Senate in the Democrats' hands." He said if Republicans gave in to Obama's demands on a tax increase for the nation's highest earners, "the focus then shifts to entitlements and maybe it puts us in a place where we actually can do something that really saves the nation." "The Internet has not been kind to House Speaker John Boehner in recent days. On Twitter, there are some new, not-so-subtle hashtags going around:#boehnermustgo, #fireboehner and #purgeboehner. "It's backlash from the right for what it sees as a pair of sins — giving up too much in his opening offer to President Obama in the fiscal cliff negotiations and ousting four outspoken Republicans from key congressional committees."